The decision was several months in coming, but Margaret Weller courageously opted to carry on with Bob Weller’s legacy and host “Frogfoot” ’s Salvaging Spanish Sunken Treasure series of summer seminars. Attendees came from as far away as Alaska and as nearby as Lantana, FL, most traveling quite some distance to be here for the classes and field trips. Due to a late start in the campaigning, or perhaps because of the economic crunch we are all experiencing, the minimum six students for each of two classes were realized and were combined into one large four-day session. This worked well with the logistics and as well with the weather (the comfort and success of the field trips is weather dependent). At 8:30 a.m. on Monday, 6 July, Margaret’s son, Rob Weller, introduced her to the “Class of 2009” on their dock—classroom at Weller’s Cove. She welcomed them, outlined the series curriculum, and then had each “student” tell something about him/herself with a brief bio and mention of special interests. The class then trekked from the steamy “gazebo-on-the-dock” to the air-conditioned relief of the “lecture hall” in Casa Weller. A presentation of the basics-plus in understanding the myriad markings on Spanish colonial coins and on ingots of precious metals being shipped to Spain was handled by Ernie Richards. The lecture evolved from, and revolved around, some excellent graphics displayed on a screen with a digital projector. From the smallest detail on a silver coin to the largest numeral series and monogram on the Atocha silver bars, the attendees were spoon fed enough information to make them students of the subject, at least at an introductory level (“I only saw two people nodding off this year!” says Ernie.) At a critical point in the lecture, Ernie invited Margaret up to explain how she found a “royal” 4-escudo Mexican coin, dated 1711, on the Nieves site … the “old way” … hand-fanning the sand away. Gary Drayton, a super-successful treasure finder from Jolly Ol’ via Pompano, FL, regaled the eager twelve gathered around the “long table” with tales and secrets of his successes with metal detectors in England and on Florida beaches. Gary had his “sample cases” with him, each filled with “this modern gold ring is worth $5,000, and this ancient ring is appraised at $45,000” types of items, which he very generously passed around the table for all to “ooh and aah” over. People love his accent, his excited delivery, and, of course, his touch-and-feel treasures. After “one for the road,” the avid adventurers returned to their individual overnight camps and read “Frogfoot” ’s Salvaging Spanish Sunken Treasure before retiring from the 96-degree day. Having done so, they were better prepared for the field trip the next morning. Wending their way up A1A, the safari enjoyed similar experiences at the other sites of the 1715 disaster between Ft. Pierce and the Sebastian Inlet. After lunch at Captain Hiram’s Restaurant, a favorite watering hole for the 1715 “salvage fleet,” the group toured the museums at the Mel Fisher Center in Sebastian and the state-owned McLarty Treasure Museum in Vero Beach before hopping onto I-95 once more for the return to Lake Worth. Wednesday’s sultry dawning was witness to the parade of shipwreck search equipment being set up on the Wellers’ dock by Doug Gossage, Rob Weller, and Ernie Richards. At 8:30 or so, Doug had his computer(s!) set up on the “long table” inside Casa Weller and began his program of introducing the attendees to the history of search and salvage as performed in past years … and… the modernization of the amazing electronics packages being used today. These included GPS positioning gear, side-scan and sub-bottom profiling sonars, magnetometers, and underwater metal detectors. Doug actually had files of software from a few of his searches, and he displayed and explained them “on screen” in the “theater.” The class was then led out onto the dock for a hands-on examination of Doug’s equipment. Ernie followed with a brief demonstration of his five-gallon electrolytic reduction tank, used in the cleaning and conservation of small shipwreck artifacts and coins. 01— Wondrous things to behold on our trip to the “Treasure Coast”. 02— Dr. Eugene Lyon (right, front) speaks before the Class of 2009. 03— Dr. Eugene Lyon (left, rear) speaks before the Class of 2009. 04— Morning break on the Wellers’ deck. 05— Gary Drayton (left, rear) shares his beach finds with the class. 06— On safari to the “Treasure Coast”, the class pauses on one of the beach access walkovers. 07— On the beach adjacent to the “Gold Wreck”, Margaret instructs the class. Salvage boat Endeavor in background. 08—(Left) Ricky Reynolds (CA) and Dale Schroeder (VA) pause on another crossover. (Right) Mark McConnell (MD) aboard the Republic Diver in the Keys. 09— (Left) Janet Schlosser and Curtis Steiner (FL) pause (and pose) on a walkover. (Right) Larry Shaak (PA) has “the time of his life” in the dune opposite a wreck of 1715. 10— The Class of 2009 takes a lunch break at Captain Hiram’s Restaurant in Sebastian, FL. 11— Some of the class pose with a Spanish anchor at the entrance to the Mel Fisher Center in Sebastian. 12— Margaret Weller and Judy Barber in the gift shop at the MFC. 13— Some of the class pose in front of the McLarty Treasure Museum in Vero Beach. 14— Doug Gossage and Margaret Weller during the preparation for his presentation on search equipment. 15— At the “Gazebo-on-the-Dock” … the class gets some introductory leads about reduction tanks. Ernie asks Janet Schlosser to check the polarity in the book Salvaging Spanish Sunken Treasure by Frogfoot. 16— Margaret and Bill Moore (MFC) share “secrets” on a map of the “Gold Wreck” site (Ft. Pierce). 17— (Left) Captain Carl “Fizz” Fismer looks dapper as he has a snack before his presentation. (Right) Rob Weller and Terry Steiner (AK) enjoy the beautiful conditions over the wreck of El Infante (Keys, 1733). 18— Carl Ward (seated, yellow shirt) answers questions about the artifacts and treasures found on El Populo (Keys, 1733). 19— Carl Ward is smiling as he poses with Taffi (Fisher) Abt and her daughter Nichole Abt in the “lecture hall”. 20— The Class of 2009 gathers for a photo-op on the deck of the Republic Diver before heading out to “the wrecks”. Bill Mathers and Dr. Hank Parker, Project Manager and Assistant Project Manager, respectively, of the Nuestra Señora de la Concepción (1638) recovery off Saipan, were up next. Taking our subject out of Florida and the Caribbean to the western Pacific, Bill and Hank detailed their research, discovery, and recovery phases of a Manila Galleon located near Guam. It had departed Manila, in the Philippines, in August 1638, and it promptly sank in the Marianas. The rich recoveries from the Concepción were displayed on screen during their fascinating presentation, and a very ornate gold chain from the wreck was passed around for examination. In a very magnanimous gesture, Bill and Hank gave each of the “seminarians” a copy of Bill’s beautiful full-color book, Treasure of the Concepción. Following a scrumptious feast of Margaret’s famous sirloin burgers, corn on the cob, and home-made baked beans (plus a tropical dessert and much camaraderie), the “Two Carls” shared the next program. Carl “Fizz” Fismer spoke first of his work on several shipwrecks, including the other Concepción (1641, Silver Shoals) and the “mogul treasure” on the reefs of Ceylon with Arthur C. Clarke. Fizz also dived the plate fleets of 1715 and 1733 in F-L-A. His tongue-in-cheek patter is always entertaining to the students, and his slide-show was colorful and informative. Wrapping the classroom portion of the seminars, Taffi Fisher Abt and Bill Moore of the Mel Fisher Center in Sebastian spoke about various facets of the Fisher Family history and treasure finds, with Bill explaining his computer “mapping” of all documented recoveries on the 1715 fleet sites and his discovery of the “hole” on the Atocha wreck containing 77 gold finger bars and much, much more (all gold). In the Q&A session which followed, Taffi was asked about the recent happenings of state and world treasure finds and what the future held for the upcoming generation of treasure seekers. Her answers were quite frank and based on her “inside” experiences and G-2. “Graduation” followed, with Ernie and Margaret handing out the diplomas (there would be no time at 9:30 on Thursday night for this) and shaking hands. Cocktail hour closed out the day’s events, with the class “riding off in all directions” to rest up before the micro-bus trip to the Keys on the following morning. Thursday arrived with gusto…temps and humidity in the 90s! Thank goodness for the A/C in the 15-passenger van. Departing the Wellers’ home at around 9:00 a.m., the open-road trip to Plantation Key took about 2-1/2 hours. There the members of the safari boarded Capt. Gary Mace’s large dive boat, soon leaving the dock behind and heading for the 1733 plate fleet sites nearby. The San Pedro wreck, near Indian Key, was sorely lacking in visibility, apparently a function of tidal influences, so the party got underway for the location of El Infante. The Infante has been good to the divers who worked the wreck since the late 1950s, yielding silver coins and wedges, arms and armament, buckles, tableware, and on and on. Always a “great” ballast pile to dive on, it was not disappointing to the divers on this day. The water was gin clear and, I’m told, 90° … like the air! Snorkelers and those with scuba training alike shared a terrific trip back through time to July 1733. On the trek back to Weller’s Cove, the air was filled with talk of the wreck, an occasional snore, and someone in the back seat using a barf bag. What a day! We’ve GOT to do this again! Margaret!!?? Those in attendance were: *Nichole Abt, Sebastian, FL; Taffi Fisher Abt, Sebastian; John Harkins, Huntsville, AL; Mark McConnell, Frederick, MD; F. Edward Mitchell, Lantana, FL; Ricky Reynolds, Oceanside, CA; Janet Schlosser, Port Ste. Lucie, FL; Dale Schroeder, Stafford, VA; Larry Shaak, Harrisburg, PA; Curtis Steiner, Port Ste. Lucie; Doug Steiner, Anchorage, AK; and Terry Steiner, Anchorage. *Subscribers in bold. The blazing heat and humidity of an early summer greeted those assembling under the “gazebo-on-the-dock” behind the manse on “Weller’s Cove” at 8:30 a.m. Monday. It was already too hot even for the usual basking iguanas and ‘gator, but the sounds of coots and grebes could be heard through the reeds and over the sizzle of the heat. Bob “Frogfoot” Weller opened his 2008 “Follow Your Dream” series (which he started in Spring, 1994) with a round of self-introductions by the attendees and an outline of the week’s program. About 10:00 o’clock, Bob called for a 15-minute break in order to stretch one’s muscles and get a cup of coffee or a cold drink. Returning, Weller and the “students” engaged in a Q&A session about salvage contracts … and the locating and recovery of shipwrecks. Burt Webber was up next, giving an excellent presentation on his work at the Concepción (1641) site on the Silver Banks. Slide-accented, his talk was very entertaining and informative. He told, very graphically, how the ship broke up and slipped between coral heads … then of his search and discovery of the two sections of it. The underwater shots were exciting in their beauty, and all wanted to don their gear and jump in! He also told us that his new ship, Ocean Lady, was finished with its overhaul and that he’d be heading back down to Hispaniola on another expedition in a few days. After the Weller “kitchen crew” —comprising Margaret Weller, Rob Weller, and “Las Dos Anas”— set out the epicurean sirloin burgers with trimmings, and when the attendees were full and anxious to get back to class, it was Carl Ward’s turn on stage. Each year, Bob’s students enjoy Carl’s “round table-hands on” approach to telling his story. The discovery of El Populo of the 1733 Spanish treasure fleet in the Florida Keys —and touching some of its artifacts— was exciting for the class to experience. The markings on the Dutch “stone-thrower” cannon found on the wreck (photos only) were similar to those being found on artifacts coming up from the Dutch merchantman Rooswijk off S.E. England in the last couple of years. The late afternoon session, a discussion and “show-and-tell” regarding beachcombing, was led by Greg Bounds and Gary Drayton, two very successful treasure hunters from the Treasure Coast. Besides the fabulous coins and jewelry from the 1715 plate fleet found by these two experts, Drayton showed how one could, as he did, pay for the large investment in detecting equipment with just one find. He brought several modern, jewel-beset rings which had been appraised at (at least) $5,000 each! They sure held the attention of the classmates that day. A cocktail hour followed, then each grinning pupil went to his (her) hotel to dream of the goodies awaiting discovery over the next dune or wave. On Tuesday, the Weller field team packed the attendees into a 15-passenger “mini-bus” and headed up to the Treasure Coast. The itinerary there included a stop at the shore coordinates for each of the known six wrecks involved the 1715 disaster …with descriptions of each sinking and its recoveries. Lunch was at Captain Hiram’s in Sebastian, a favorite haunt of the members of the 1715 “Salvage Fleet.” Tours through the Mel Fisher Center’s Treasure Museum in Sebastian and the state-operated McLarty Treasure Museum in Wabasso completed the field trip, and the air in the mini-bus on the way back to Lake Worth was filled with recounting what had been seen, questions, and laughter. As stale as it may sound, a good time was had by all. Back to class bright and shiny at 8:30 Wednesday morning, the “seminarians” attended a four-part presentation by Ernie Richards which focused on the types of coins and precious-metal ingots recovered from various shipwreck sites. Opening with the types of silver coins found on the Atocha, the lecture offered photos and diagrams displayed on a screen by a digital projector to explain the “hieroglyphic” stampings seen on coins of the period. A similar program about the silver and gold coins of the 1715 fleet brought the story forward in time. The third presentation concerned a 70+ pound, Class-1 silver ingot from the Atocha … and the many important stampings and engravings to be seen on it. Finally, a cursory discussion of the Dutch East Indiaman ROOSWIJK’s sinking in 1740 and its recent salvage was given. This brief session was punctuated with, first, an 8-minute video clip directly from the wreck site (thank you, Tony Lauder), and then by a small hands-on exhibit of the variety of coins and one of the small silver ingots (thank you, Dr. Alan Craig) recovered from Rooswijk. The attendees had shown such enthusiasm for Carl Ward’s artifacts that, as a special treat, he returned with more of the artifacts from El Populo for them to examine. Nice surprise! After another great lunch, Bill Mathers and Corey Malcom gave a joint lecture concerning their project off Saipan, where they performed archaeology and salvage on another Concepción, this one the Manila Galleon of 1638. In a Power-Point presentation, the talk was graphically accented with charts and photographs of equipment, people, and events surrounding the three-year project, which resulted in Mathers’ beautifully-illustrated (in color) book Treasure of the Concepción (1993). Mathers was Project Director and Malcom was Project Archaeologist for this milestone underwater operation, and their insight was truly welcomed by all of us. John S. Potter, Jr., author of The Treasure Divers of Vigo Bay (1958) and The Treasure Diver’s Guide (1960), two of the classics in our industry and two which gave most of us the start we needed, brought with him a treat to close out the classroom portion of this seminar. John spoke to us of the destruction of the Spanish treasure fleet of 1702 by the combined Dutch and English fleets at Vigo Bay, Spain, and his subsequent salvage attempt there. He also spoke of his adventures and mis-adventures in that attempt. He ran a vintage (mid-50s) film which he had converted to a VHS tape, a film which contained some very early underwater footage. This was most enlightening and a privilege to see. Thanks, John. 01—A view of Weller’s Cove. 02—Class No. 2, morning session under the Gazebo-on-the-Dock. 04—“Las Dos Anas.” The two nice young ladies who prepare and serve Margaret’s great menus. 05—Class No. 2 at a beach site opposite one of the 1715 galleon wrecks. Margaret Weller explains. 06—(Left) Carl Ward explains his association with the El Populo wreck site of 1733 in the Keys. (Right) John S. Potter, Jr. spoke about the Vigo Bay wrecks, and Bill Mathers gave a presentation on the Manila Galleon Concepción (1636) off Saipan. 07—Ernie Richards explains the operation of an astrolabe to Johnno Potter; Bill Mathers and Carl Ward look on. 08—(Left) Corey Malcom (MFMHS) was archaeologist for the Saipan Concepción project. (Right) Margaret “Lady Gold-Diver” Weller explains her discovery of a Mexican four-escudo “royal” on the “Nieves” site of 1715. 09—“Frogfoot” explains some of the details of a doubloon to Bob Rembisz (St. Augustine). 10—Dr. Hank Parker (left) and Bill Mathers (right) of the Saipan Concepción project. 11—Burt Webber introduces the Concepción of 1641 (Silver Banks) to Class No. 1 in a morning session under the gazebo. 12—Hands-on examination (left) of a Spanish “vanilla bean jar” from the wreckage of the 1715 fleet by John Rollins (WPB) and Mark Miller (CT) of Class No. 1. 13—Mike Brown (GA) gets to hold a “pound” of gold chain from the galleons (left), and Bill Moore of the Mel Fisher Center in Sebastian tells of his discovery of a stack of 77 gold finger bars on the Atocha main pile. 14—Margaret and Bob Weller introduce the attendees to the concept of salvage diving on the wrecks of the Spanish Treasure Fleets of 1622, 1715, and 1733. 15—(Left) Class No. 2 stops at Captain Hiram’s in Sebastian for lunch during their tour of the Treasure Coast wrecks. (Right) Greg Hupé (Lake Placid) and Richard Johnson (WPB) examine the Portuguese-designed astrolabe as found on the Atocha. 16—Burt Webber continues his instruction regarding the 1641 Concepción recoveries to Class No. 1 … indoors, out of the steamy heat below on the dock. 17—A gathering of eagles. (L-R) Noted salvagers Bill Mathers, Bob Weller, Johnno Potter, and John Potter mug for the camera under the gazebo. 18—(L-R) Gary Mace (Keys dive boat owner/captain), Rob Weller (field-trip manager for the seminars), and Carl “Captain Fizz” Fismer (well-known Keys salvage diver) smile for the camera. 19—Members of Class No. 2 gather in the “classroom” to record an historic moment. 20—Some then joined us at the SummerFUN Coin Show at the Palm Beach County Convention Center in nearby West Palm Beach. On Thursday, the class boarded the Florida Turnpike and headed for Plantation Key, a 2-1/2 hour trek from Lake Worth. There they met up with Capt. Gary Mace of Conch Republic Charters for their outing and dive to a couple of the wreck sites of the 1733 Spanish treasure fleet nearby. Visibility was only about 10 feet on the bones of the San Pedro off Indian Key, but all could see the (replica) cannons and the ballast stones on this state-owned historic shipwreck site. One of the divers, I am told, found a piece of one! A greenish, coppery thing! With a picture of Abe Lincoln on it! At the site of El Infante on Little Conch Reef, out to sea from Plantation Key, the divers had a photo-op with some of the ribs, rocks, and planking visible. This completed the week’s events, and the drive back to home base must have been anti-climactic. ATTENDEES (alphabetically): Dr. Joseph Bonura (St. Augustine, FL); Chad Coles (Indianapolis, IN); Monique Coles (Indianapolis, IN); Greg Hupé (Lake Placid, FL); Richard Johnson (WPB, FL); Mark Miller (Guilford, CT); Jeff Moore (Liberty Township, OH); Richard Politano (Valrico, FL); John S. Potter, Jr. (Oak Bluffs, MA); John S. Potter III (Oak Bluffs, MA); Bob Rembisz (St. Augustine); John Rollins (WPB, FL). (PLVS VLTRA subscribers’ names underlined). Much like the previous session, Monday’s classes opened with introductions and a nutshell history of the 1715 fleet’s demise and recoveries, delivered by Bob and Margaret Weller. This was followed (after lunch) with round-table discussions by Dave Crooks —about the laws of shipwreck salvage in Florida— and “how-to-get-started” (and run) a successful operation by Brad Johnson. The afternoon sessions were wrapped up by Gary Drayton and Greg Bounds and their tales of beach treasures —and plenty of examples for examination. Following the established format for these gatherings, Tuesday saw the class pack off in a micro-bus and head for the Treasure Coast, where they visited the 1715 wreck sites (on the beach) and the McLarty and Mel Fisher museums. Lunch, of course, was at the waterfront restaurant called Captain Hiram’s. Wednesday, it was back to the classroom, where “Captain Fizz” regaled the attendees with his animated and entertaining manner of telling the stories of his adventures as a salvager. Ernie Richards followed with his digital slide show presentation, explaining the gold and silver coins and bars coming from the 1715 and 1733 fleets, and his new “intro” to the VOC’s Rooswijk, lost off southeast England in 1740. After some of those delicious sirloin-burgers with trimmings at lunch, Bill Mathers and Hank Parker explained their experiences in researching and salvaging the “Concepción” of 1638, a Manila Galleon lost off Saipan on her return voyage. Bill Moore, Chief Conservator (and more) at the Mel Fisher Center in Sebastian, gave a slide-accented accounting of his finding a hole on the Atocha site which produced seventy-seven gold finger bars! Not many people can make that kind of claim!! ATTENDEES (alphabetically): Rick Beleson (San Francisco); Mike Brown (Albany, GA); Dave Crooks (Clarendon Hills, IL); John Justice (Lewes, DE); Don McNichol (Brewster, MA); Sunny Ommanney (Venice, CA); Nick Pliam (Los Altos, CA); Alan & Sandy Sadwin (Wantagh, NY); Alex Saunders (Venice, CA); Mark Silicato (Milford, DE); Rand Smith (Atlanta, GA); and Craig Thomas (Bradenton, FL). (PLVS VLTRA subscribers’ names underlined). If shown in black and white, the setting would have seemed like a scene from some Peter Lorre and Sydney Greenstreet movie, taking place in some sweltering Saharan gin mill, complete with a large-bladed overhead fan. But it was in living color, and it was the exotic Weller’s Cove location of Frogfoot’s “outdoor classroom on the dock” in Lake Worth, Florida. Although Monday morning’s temperature was already in the 80s by 0830, the shade of the gazebo-come-school house and the gentle breeze off the cool post-dawn waters made living in this miniature slice of paradise quite tolerable. And the subject of the morning’s lecture opener —sunken treasure— made everyone forget any possible discomfort. The “staff” of hostess Margaret Weller, her son Rob Weller, and the kitchen team of “Las Dos Anas” had already served piping-hot and strong coffee, fresh fruit juices, and assorted pastries to the ten eager “students” in attendance; it was time to dig into the plan-of-the-day. Frogfoot opened the session with a call for self-introductions by each person in the class. He then dived into the details of “Salvaging Spanish Sunken Treasure” with his usual enthusiasm for the subject. Around noon, the attendees and the day’s lecturers gathered on the open and canopied deck at the rear of Casa Weller and were treated to delicious ground-sirloin burgers, garnished as you like ‘em, fruit juices, salad, and key lime ice cream. More of that special coffee was available to those of us who thrive on caffeine, and some great, animated conversations ensued. All good things must come to an end, and the “students” adjourned to the G(old)-rated and air-conditioned “theater room” for a lecture delivered by archaeologist Jim Sinclair, who was the chief conservator during the entire Atocha Project in Key West. Using a Power-Point presentation, Jim held everyone in his grasp as he related, first, the Atocha story as told by an insider and, then, a discussion of his association with the Titanic recoveries, for which he served as archaeologist. In a mere blink of an eye, his two-hour presentation was, sadly, over. Sinclair is a very knowledgeable scientist … and a glib and entertaining speaker. When the lectures and Q & A sessions were over, the general discussion turned to “sea stories” about treasure diving and SCUBA diving in general, much to the enjoyment of those involved in this exchange. Bright and shiny Tuesday, Frogfoot and son Rob, led a car-a-van northward toward Sebastian Inlet on Florida’s east coast —the area known as the “Treasure Coast.” The general itinerary, while returning southward, included stops on the Atlantic shore opposite the sites of the 1715 wrecks known locally as the “Cabin Wreck”… “Corrigan’s Wreck” … the “Rio Mar Wreck” … the “Sandy Point Wreck” … the “Wedge Wreck” … and the “Gold Beach Wreck” —where literally tons of silver coins were recovered from the stricken fleet in modern times, and where Weller told the class of each ship’s break-up and subsequent salvage operations. The “beach tour” was spiced up with stops at the Mel Fisher Center (museum and conservation lab) in Sebastian, Captain Hiram’s for lunch, Mel Fisher’s home in the 1960s and the state-owned McLarty Treasure Museum, both in Vero Beach. Back to the class-room. Due to unexpected construction noise from nearby I-95, the morning instructional session was transferred from the gazebo-on-the-dock to the front room “museum” of Casa Weller, where Carl Ward began his program. 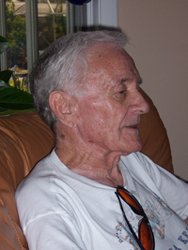 Carl is a long-time friend of the Wellers and Richardses and was an important figure in the recoveries made on the 1733 Spanish silver fleet wrecks in the Keys during the 1960s … most specifically the wreck called El Populo. He is a retired Miami policeman, who also served as “bodyguard to the stars” … some of whom were Julio Iglesias, Gloria Estefan, and Diana Ross. Breaking for lunch around noon, we were once again treated to a succulent feast. This time, barbecued ribs, corn on the cob, baked beans, heart-of-palm and mango salad with lime and dijon mustard vinaigrette dressing, and fresh fruit dishes were offered up by the Weller cocina. The class then re-convened in the “theater room” for a slide-accented presentation by Dr. Lyon about how his archival research in Seville led to the Mel Fisher operation locating the richest single Spanish shipwreck found to date in U.S. territorial waters: Nuestra Señora de Atocha. Beginning with a background history of the major annual treasure fleets and their routes, Lyon explained the reason for the 1622 treasure armada being where it was when the hurricane struck them, how some ships survived, and how some returned to Havana via the Gulf of Mexico. He also covered the subsequent contemporary salvage attempts —and their varying successes— before relating the insider’s view of how he examined markings on cannons and silver ingots, which Mel’s divers were finding, and related them to the ship’s manifest and other documents … positively confirming the identity of the Atocha. The members of the class took copious notes when Dr. Lyon began remarking about the other “big ones” (treasure losses) which he had found in the records. He gave out ship names, places of loss, size of treasure cargo —everything but satellite co-ordinates to the wrecks— much to our collective delight. Following a short intermission for “nature call,” etc., we returned to the theater area for a two-hour review of the Manila Galleon trade and one specific modern salvage project. Bill Mathers and Hank Parker, Project Director and Assistant Project Director, respectively, brought into our study the importance of the Manila trade to the Spanish and other Europeans during the era of world colonization. Mathers and Parker laid out in detail the clockwise route of the Manila Galleon in the Pacific and how the prevailing winds and currents there permitted such long-distance travel in such cumbersome sailing vessels of old. Tuning in on the loss of one ship in particular, they told of the wrecking (during its return leg in 1638) of Nuestra Señora de la Concepción off Saipan in the Mariana Islands north of Guam. Not counting the research and planning, they spent two years on the site of the sinking and recovered —in a tight archaeological manner— a fabulous treasure of Asian ceramics, gold jewelry, ornate gold boxes and buttons, jewel-bedecked gold filigree religious items, and remnants of the jars which may have carried the spices so important to this trade. One of the more exciting artifacts recovered was a solid gold comb, engraved with the owner’s name and the date it was made: Doña Catalina de Gusman, 1618. Their meticulous recovery of such precious cargo has certainly placed the punctuation marks in what had been known and written before them of the Manila Galleon. People attending Frogfoot’s summer seminar came from as far as Oregon and as close as Port St. Lucie, FL this year. It was a great pleasure for me to meet these “students” … a couple of whom are subscribers (in bold) … and to catch up with the other lecturers. In alphabetical order, the summer class included: Stan Dilcher, Marietta (GA); Shelly Jolley, Boise (ID); Jeff Moore, Liberty Township (OH); Mark Naylor, Hamilton (OH); Art Schweizer, Portland (OR); Dan Scocozza, Port St. Lucie (FL); and Rick Wyman, Kuna (ID). Weather conditions couldn’t have been better for lectures under the “Gazebo on the Dock.” A cool (for Florida) morning breeze wafted over “Weller’s Cove” into the outdoor “classroom,” carrying the fresh aroma of aquatic vegetation and the sounds of coots and grebes feeding among the reeds. Four large iguanas were basking in the warm morning sunlight on the bank across the canal. The nine attendees had been served breakfast under the awning on the Wellers’ deck and were assembled on the dock by 9:00 a.m. for the first session on Thursday. Bob Weller opened the round of self-introductions by the new classmates then began his “Salvaging Spanish Sunken Treasure” program, covering the history of salvage, laws pertaining to this activity in Florida, and the professional details involved in salvage: technique, tagging and bagging artifacts, creating the paperwork required for subcontractors, year-end division of the artifacts recovered, and much more. Following lunch, the group retired to the air-conditioned indoor classroom for an excellent two-hour lecture by Burt Webber, who regaled his audience with specifics of his research, search, and eventual salvage of the Concepción (1641) on the Silver Bank north of Hispaniola. Burt detailed the involvement of the Dominican government, his innovative salvage techniques and equipment, and the final count on the coins and other artifacts which were retrieved from the coral garden that had overgrown the galleon. After a coffee break, Ernie Richards took the stage and tutored the class in “reading” the history book which is a Spanish colonial coin. Silver coins from the Atocha site, silver and gold coins of the 1715 plate fleet wrecks, and the Atocha’s large silver “breadloaf-sized” ingots were all explained in detail via a presentation accented with computer-generated slides. One such bar from Weller’s collection was then unveiled for a hands-on examination by those in attendance. After this full day of very focused instruction, the class was quite ready to adjourn to the shaded and well-stocked oasis on the deck behind the Weller manse. The swapping of sea stories, through wetted whistles, occupied all for an hour or so before going our separate ways, in preparation for resuming the routine at 9:00 a.m. the next day. Friday’s program began with discussion specific to the Spanish treasure fleet of 1715, ably delivered by “Frogfoot” … followed by a familiarization of some of the equipment used by the salvagers on Florida’s east coast. This included blowers, metal detectors, hookah rigs, and magnetometers. The morning being so occupied, the class was ready for the lunch break, following which the attendees were introduced to their next guest lecturer, Jack Haskins. Haskins related his many experiences —both as a diver and as an archival researcher— as pertained to his uncovering on paper the locations of many of the major Spanish treasure wrecks known today and his involvement in their subsequent salvage operations. 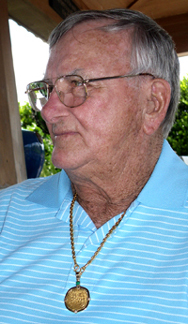 Specifics of working at the Archives of the Indies were shared with the class, and Jack humbly told the stories of some of his greatest finds on the sites of the 1733 Spanish plate fleet in the Florida Keys, one of which —a bejeweled golden Virgin of Guadaloupe medallion— is generally conceded by most salvagers to be the greatest artifact ever recovered from that fleet. A gourmet dinner Friday night, prepared and conducted by Margaret “Lady GoldDiver” Weller, her son Rob Weller, and the “Two Annas” was an epicurean delight enjoyed by the classmates and the guest speakers. Saturday’s scheduled itinerary for the attendees included a coastal tour of the known sites of 1715, a stop at the McLarty Treasure Museum in Vero Beach, and a visit to the Mel Fisher Center in Sebastian. Early in the a.m. Sunday, the caravan of students was off to the Keys for a dive on the 1733 wrecks of the San Pedro and El Infante (heavy lightning turned the trip into a visit to nearby “Treasure Beach” for a metal-detector outing). People attending Weller’s first 2006 seminar came mostly from Florida, but some came quite a distance to take advantage of this unique opportunity. They were: Jorge Adeler and Augi García-Barneche of Historic Real Treasures, Great Falls, VA; *Scott Braico, Brandon, FL; *Ian Chatterton, Tampa; *Joe and Kelly Espi, Lutz, FL; *John Koellisch, New Port Richey, FL; and Greg and Heather Kufchak, Catania, Sicily. *(All associated with Famous Treasures, a metal detector retail store in Land O’ Lakes, FL). The format for the second installment of Bob Weller’s “The American Dream” Seminars 2006 pretty much followed the first, with a couple of changes in the cast of characters. Bob opened the Thursday session with introductions and more. His presentation was followed by one conducted by Tracy Bowden, who has worked shipwrecks located in the waters of the Dominican Republic for about 30 years. Famous for locating and salvaging the two “Quicksilver Galleons” of 1724, Tracy has most lately been “fine tuning” the salvage of the Concepción of 1641. His two-hour program re-capped his experiences in running salvage operations outside the US and the night-and-day differences of conditions in Samaná Bay vs. the Silver Bank. The program concerning silver and gold coins of the 1622 and 1715 fleets and delivered by Ernie Richards wrapped the instructional part of the day, and the class adjourned, once again, to the Weller’s deck and dock for some libation and camaraderie. Friday morning, Bob introduced historic shipwreck salvager John Brandon to the class. John’s presentation concerned his experiences as one of Mel Fisher’s key people in the recoveries of the 1622 Atocha and Margarita … and the subsequent years on the sites of the 1715 fleet. John’s wit was apparent as he provided the patter for his slide show, a TV video about an actual recovery, and an old home movie-come TV video of the early Fisher operation on the 1715 fleet. In the afternoon, Jack Haskins returned to the stage (armchair on the dock) for his discussion of archival research and dive experiences on the Quicksilver Galleons, 1715 and 1733 fleets, and the Pedro Banks off Jamaica. Dinner that evening was at Don Ramon’s Restaurant in West Palm Beach; the Cuban cuisine seemed to be enjoyed by all. Saturday saw the crew in a caravan heading north early in the a.m. for the round of the beaches opposite the 1715 plate fleet sites, the McLarty Treasure Museum in Wabasso, and the Mel Fisher Center in Sebastian. Sunday’s trip to the Florida Keys was quite a success, with the students diving/snorkeling on the Infante and San Pedro wrecks of the 1733 fleet, an outing of over six hours in/on the emerald waters there. Many, many of the attendees of both seminars expressed their appreciation of the programs, and several indicated “we have to do this again next year!” As a matter of fact, there are returning participants at each new session. Chris and “Wick” Wickliff of Las Vegas just happened to be vacationing here this year (third time attending), and Dave Crooks from the Chicago suburbs was also a third-time member of the class. Attendees of the second session were Ann Brambl, Fort Smith, AR; Gary Beaudoin, Manchester, NH; Jack Butler, Delray Beach, FL; Kevin Cantrell, Kim Cantrell, and Kory Cantrell, Iuka, IL; Dave Crooks (third time attending), Clarendon Hills, IL; Henry Jones, Cleveland; Ron Witham, Heather Dickson, San Francisco/Halifax. –ed. Jack Haskins (left) and Bob Weller represent almost 100 years of combined shipwreck research, location, and salvage experience, bringing this to the Summer Seminars.